MainBlogsFundamentally FreundWho's Afraid of Public Opinion? Who's Afraid of Public Opinion? He has led men into battle, braved enemy gunfire and engaged in some of Israel’s most daring and well-known military operations. But for all the courage he has shown on the battlefield, when it comes to the political arena Ariel Sharon has suddenly lost his nerve. And yet, Sharon’s statement actually raises more questions than it answers. If indeed he is so sure that the country backs his move, then why is he afraid to put it to the test of public opinion? And if a majority actually opposes such a plan, then how legitimate would any withdrawal actually be? 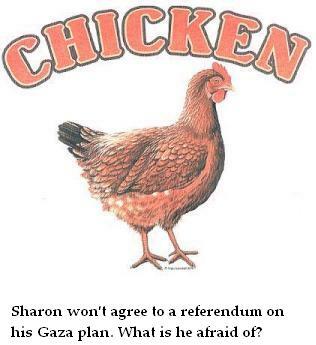 Sharon also sought to argue that a referendum would divide the nation still further – but that is simply untrue. The whole idea of giving the public a voice on the issue is to stifle the growing split within the country, because the outcome would necessarily result in the bulk of the Israeli public accepting whatever the majority would decide. Moreover, if Sharon refuses to hold a referendum, and goes ahead with the withdrawal anyway, it will leave an open wound on Israel’s national psyche. Rightly or wrongly, huge portions of the public feel that Sharon has no mandate to pull out from Gaza, leaving a heavy scent of illegitimacy hanging over the entire affair. The only way to dispel that notion, and to re-unite the country, is to hold a referendum as soon as possible. Deep down, I think that Sharon knows that. But whether or not he still has the courage of his convictions, as he did long ago during his military career, only time will tell.